Throughout the year, the Seaside Aquarium hosts a variety of groups for education purposes. Classrooms from Oregon and beyond, scout troops, and other groups visit the aquarium to learn about local sea life. But the aquarium also provides education beyond the boundaries of its walls. This can include research programs at a school or a unique in-the-field opportunity. This school year, students in both Astoria and Seaside were able to participate in real-world research in cooperation with the aquarium. In the fall, Astoria High School students dissected a number of sharks that washed ashore to provide information for researchers in California and Alaska. This winter, a class from Broadway Middle School in Seaside watched a dissection of a baby gray whale and then helped dispose of the body. Last summer a number of salmon sharks washed ashore on north Oregon beaches. Two researchers were interested in the phenomenon, so the aquarium enlisted Lee Cain�s salmon biology class in Astoria to help collect information on five of the sharks. 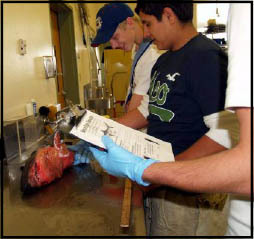 Approximately fifteen students working in teams took a variety of measurements as well as tissue and spinal samples. The red and white muscle samples were sent to a researcher at Stanford. Spine segments were sent to the Alaska Fish and Wildlife Department. 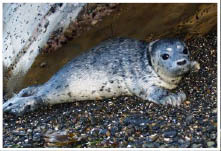 Harbor seal babies are born in spring and summer and can be found resting on the beach while their mothers search for food. Well-meaning people sometimes think that a baby seal alone on the beach has been abandoned, but this is not the case. The mother is often nearby, watching, but will not approach with people around. If the baby seal is moved, it has no chance of reuniting with its mother. If you see a baby seal alone on the beach, leave it alone and call the Seaside Aquarium so we can post signs around the seal to encourage everyone to stay away. Do not, under ANY circumstances, touch or move the baby seal. University, and the head of the Marine Mammal Stranding Network, regularly uses marine mammal necropsies on the beach as learning opportunities for her college students. This time she included a considerably younger audience. The 7th graders watched as Duffield, Nelio Barros, a research associate, and Duffield�s students took tissue and organ samples. 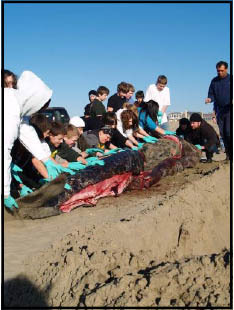 Then many donned rubber gloves and helped push the whale into a hole dug on the beach where the whale will decompose. The aquarium is always looking for unique opportunities to connect students with real world research like this.